Fox wedging is a technique where the end of a tenon is split and a wedge is inserted, before fitting said tenon into a blind-mortise (a through-mortise can be wedged from the outside). As the piece is hammered home the wedge bottoms out in the mortise forcing the tenon to spread and wedge in the mortise. It makes for a very strong joint. I was recently converting an old damaged-beyond-repair thumback style Windsor chair into firewood and stumbled upon the chairmakers version of the fox wedged tenon. The blind mortises in the chair seat have been drilled with a chairmakers spoon bit, which results in a round-bottom hole. The bottom of the chair-back spindle has been turned to resemble the hole, split and outfitted with a wedge, which will expand the tenon to completely fill the hole when the spindle is hammered home. Very clever and sly...as a fox. Above you can see the wedge in the right spindle hole. I have had an attraction to early cabinetmaker's tool chests since I started accumulating tools about thirty years ago. The one in the opening photograph is my favorite and most decorated, adorned with elaborate inlays and exotic woods. This chest was advertised in the local newspaper. I purchased it from a retired minister who had bought it in Virginia in the mid-1960s. When he found it, it was full of the original tools. The minister told me that he did not have enough money to buy the chest and its contents, so he just bought the chest. It is a rare thing indeed to find an intact chest with its original complement of tools. Many tool dealers mine the chests for their tools and sell them off individually for a higher profit than could be had for the whole package. Most joiners, cabinetmakers and carpenters in the eighteenth, nineteenth, and early twentieth centuries stored their tools in a chest like this. They were usually constructed during an apprenticeship and then filled with tools as the craftsman could afford them during his working life. The chests served several functions, most important being safe and secure storage. The chest was also an easy way to transport tools to either the jobsite or a new shop. I think that the chests also served as a resume of sorts, exhibiting the craftsman's skills to potential employers and clients. When I was looking for a way to store my chairmaking tools, I decided to make a version of a cabinetmaker's tool chest, albeit smaller than the typical chest. My chairmaking tools are specialized and not generally used unless I am working on chairs. So it seemed logical to store these tools together, with the chest being moved out of the way when not in use. I occasionally take workshops and work away from the shop, so like the originals it travels well despite requiring two people to move it. My chest is made of eastern white pine and mahogany with veneers and inlays of rosewood, mahogany, zebrawood, and ebony. Its painted with milk paint and I had the Federal eagle painted on the front by a local painter. In the shop it sits on a dolly and is easily rolled to where its needed. I recently had the opportunity to replace a missing tilter on the rear leg of a Shaker side chair. According to Tim Rieman in "The Encyclopedia of Shaker Furniture," the tilter is "a device designed by Shaker chair makers to allow the chair to tilt backward slightly without causing damage to the wood floors. It consisted of a half-sphere inserted into the hollowed rear post of a side chair, secured with a leather thong passing through holes drilled into either side of the post and through the rounded portion of the ball. A metal version was patented by Brother George O. Donnell of Mount Lebanon in 1852." One thing that you notice when working on period pieces of furniture is the conservation of materials. That's why there is primary wood (skin) and secondary wood (bones). The opening photograph is an excellent example of the conservation of material. This large molding at the waist of a tall clock case is primarily of cherry laminated to poplar to build-up the required shape. 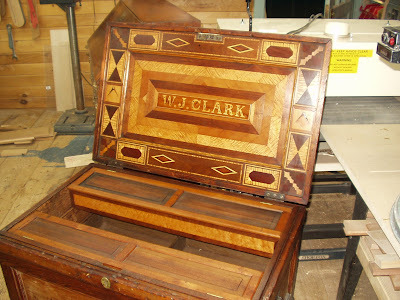 Typically you see this done with mahogany as it has always been expensive, and less so with more abundant cherry. I love this next photo. Most wood working apprentices, at some point in their training, are sent off to find the board stretcher. It's a great joke on them, akin to a snipe hunt for first year campers at scout camp. And at times I wish I had a board stretcher after crosscutting a board too short. But here, you can see, the craftsman actually stretched the board by dovetailing in an extension piece. Brilliant. No one was ever going to know except some future repairman....who in this case was very impressed. A pommel knife (bottom) is a chairmakers tool. It is basically a drawknife with one of the handles in line with the blade. This configuration allows the chairmaker to shape the chair seat in the area of the pommel (the raised area at the front of many windsor chair seats). This tool was developed beacause the bent handle of the drawknife would not allow the tool to negotiate the curve of the pommel. Here you see a series of Bunn feet for a ship model case. The client wanted ivory feet. The best that I could come up with is holly. They turned out pretty well. Yes, that seems to be the response from people when I reveal my latest project endeavor. The follow-up question then being "have you ever built a boat?" My answers are yes and no, respectively. I have been wanting to build a boat on-and-off for about sixteen years. I have lived almost my entire 51 years within a half mile of the ocean, so I see this as a perfectly natural and appropriate project after having my body and soul infused with salt air for so long. The boat that I plan to build is a Herreshoff 12-1/2. I fell in love with this boat after bumping into her at the Woods Hole Historical Museum about 15 years ago. She was originally designed by Captain "Nat" Herreshoff and built by the Herreshoff Manufacturing Company in Bristol, Rhode Island, in 1914. 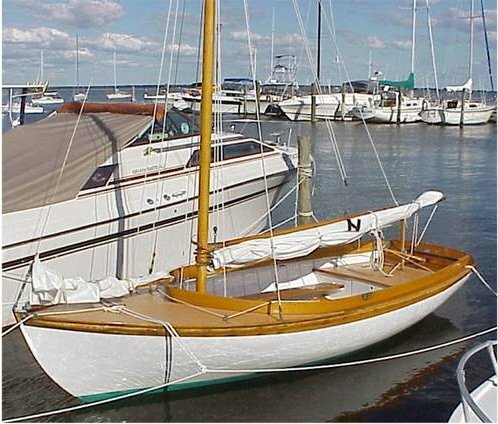 She was designed for sailing in Buzzards Bay and become the most popular boat they built, ending production in 1943. The company went out of business shortly thereafter. The overall length is 15-1/2 feet, 12-1/2 feet along water, with a 5 foot 10 inch beam and 1-1/2 foot draught. The plans arrived yesterday, so I've just started immersing myself in them. The first order of business is to find a place to "loft" or draw the plans full size. Once that is done, I can start thinking about a boatbuilding shed...This is going to be great fun. Stay tuned. 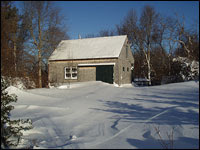 I am a self-employed furnituremaker working on Cape Cod, Massachusetts. I have been working with wood for thirty years; sometimes part time, presently all the time. I am passionate about the study and reproduction of American period furniture forms. My practice also includes conservation and repair of antiques; working closely with private clients, antique dealers and museums.